I was really looking forward to getting my hands on Office 2008 a year ago. It looked promising, an update to a major Macintosh software title four years in the making. I won’t pretend that I really wanted this software to be great. I always hope software for the Macintosh platform is great. And having read many online reviews, as well as David Cohen’s first-hand reports, on Microsoft Office 2007 for Windows, I had high hopes. When four MyMac Magazine staff members sat down with Microsoft at the Macworld Expo in January, including myself, it was with some trepidation and still excitement on my part. Trepidation because, at that point in time, I had been using the software for a few weeks and was experiencing some problems with the software, Microsoft Word in particular. Excitement because I was hoping to hear that the final, in the box version, had been updated to address some of the bugs and overall wonkiness I had experienced. I won’t say the meeting was contentious, but there were times when we asked hard questions to which the answers did not really address our concerns. Or the concerns we knew out readers had. Still and all, I held out hope that Office 2008 was not as bad as I had been experiencing. A year later, reality has set in. I am often asked by readers of the site, and listeners to our weekly podcast, if they should invest in Office 2008, or continue using the older 2004 version. Sadly, a year into it, and I still cannot recommend the newer software. The first problem I had is one that has still not been addressed. Office 2008 takes way longer to start up than almost any other program on my computer. It’s just doggedly slow. On the same Macintosh, a 2.8GHz iMac, Adobe PhotoShop CS4 launches faster than Microsoft Word 2008. When a word processor takes that long to launch, something is wrong. 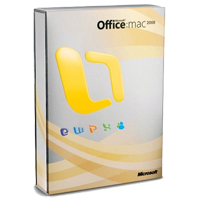 Another reason I have a problem recommending Office 2008 is Apple. The new version of iWork comes with some really great software for an average Mac user that does most of the things they need at a quarter the price. With iWork, you get a very capable word processor (Pages), a better in almost every respect presentation software (Keynote), and a very well done, and much easier to use, spreadsheet. (Numbers). And at $79, well, Microsoft’s asking price of $399 (or $229 on Amazon) for Office 08 looks less like a good buy. Like you, I was excited about the prospects of a new version of Office. Office X to Office 2004 was a fantastic update, and I was expecting this to make the same great leap. When I received my review copy, I quickly installed it. It took forever to install, much longer than any before, so maybe it was full of great new features? Well, yes and no. There are a lot of changes in Office 2008, some good, some not so good. For starters, Microsoft has carried their Vista thinking here as well, basically moving all the controls and functions you have come to know and use, and putting them ALL in new places and locations in the program. I found it took me twice as long to do anything in Word or Excel because I was always fumbling around for the functions I needed. Yes, you will learn the new interface elements, but even after using Word for almost a year now, I still have trouble remembering where some of the lesser used commands are or how the new interface applies changes. And out of the box, this was the slowest version of Word and Excel I have EVER used, both installing and running. And it takes forever to launch. What is it doing? I still use 2008 Word and Excel on a daily basis. I have not had to use PowerPoint so I have no experience on that piece. Microsoft has improved the speed in all aspects with recent updates, as well as the stability; it does not crash very often now. A year later, I am used to the interface (but, as I said, still searching for functions from time to time) and I do like that it is compatible with the Windows version. Now as to why Microsoft felt it was necessary to invent and implement a whole new document format for all of Office’s file types is beyond me. However, I rarely save in the new document format, as it is impossible for most people to open them still, but thankfully there is a default setting to save in the older format. Some of the new features (I can cover if you like) are only marginally useful in my view (like Gallery) but in general, it works well enough, and there are some good improvements in layout and formatting. Knowing what I know now, would I have spent the money to update from Office 2004? On my PowerPC machines, probably not. I suspect there is some speed improvement on Intel machines, but I do not know that, and the marginally incremental improvements on Word and Excel, there would be little reason to make the change in my view. As far as Entourage is concerned, a few days after installing it, I removed it. Like Tim said, the launch time is ridiculously slow, and the overall speed of the program is VERY slow. Granted, I am not on a new Intel MacBook yet, but my 1.5Ghz 12″ PowerBook was running Entourage 2004 just fine (as well as other Office programs.) Here, if I clicked from the email view to the calendar view or back, it could take up to 30 seconds or longer to switch views. After fetching new email, the email program would hang for many minutes, most likely my rules spinning on the new email for a very long time, and I could not do anything while that took place. And while after Microsoft’s first update it did not crash as often, I found it was taking me twice as long to get through my morning email than it did on Entourage 2004. And like the rest of Office 2008, I had to learn a new interface again. Also, I use a Palm Treo, and Microsoft removed from Entourage 2008, the sync software which was included free in 2004 . So speed, crashes, and loss of functionality combined, Entourage 2008 was removed from my system. I now use Apple Mail, Calendar, and Address Book, and with Missing Sync, MobleMe and Apple Sync on the Mac, my iPod Touch and Palm Treo are all up to date and synced. And all those Apple programs were free! And, I get through my email even faster than I did in Entourage 2004. So from an email/calendar point of view, there is almost no reason to update. I do believe some better Exchange Server functionality was added to 2008, but again, I do not use it, so I cannot comment. But it would have to be required to get me to update! So, should you buy Microsoft Office ’08? Do some research yourself, ask yourself why you think you need it, and look at your budget. Only you can answer the question.